The Foundation’s new book The Irish Friend by Bill Jackson is now available. Buy The Irish Friend now from our bookstore. 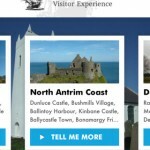 In late 2011, Digital Circle and Momentum, working with the Department of Culture, Arts and Leisure, launched a cultural apps competition for the creation of two apps: one for the Ulster Historical Foundation and the second for the GAA and Comhaltas. After months of development, we are holding a reception in The Metropolitan Arts Centre (MAC) to welcome the release of the apps. The Foundation produced content for over 200 locations in Ulster, each of which reveals something of the strong historic and cultural links that unite Scotland and Ulster. 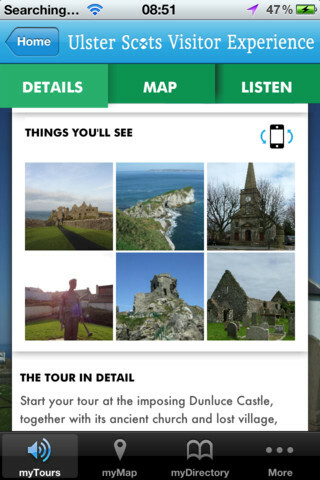 The sites range from castles and churches to monuments and museums, and chronologically cover the last 500 years. 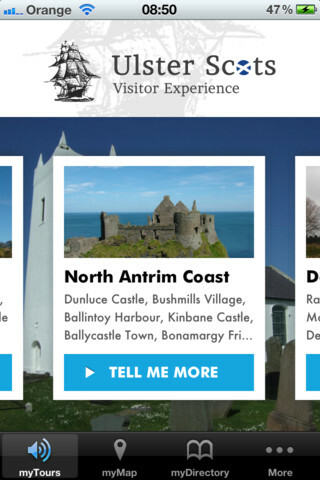 Some of the sites are spectacularly situated, with stunning views of the surrounding countryside or coastline. Others are in less familiar locations, but still with great Ulster-Scots stories. The information compiled includes a brief description of each site highlighting the Scottish story, GPS co-ordinates to aid finding it, and surnames associated with the site to highlight the human interest story. 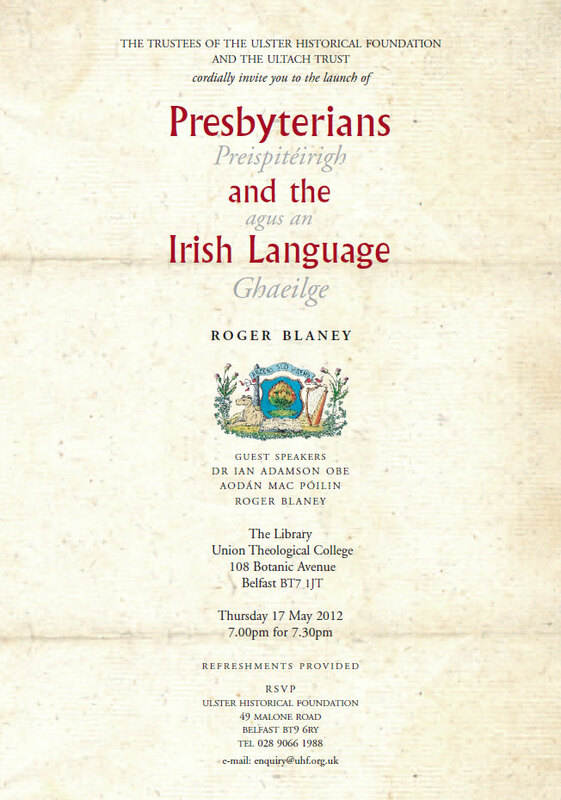 The trustees of the Ulster Historical Foundation and the Ultach Trust cordially invite you to the launch of Presbyterians and the Irish Language by Roger Blaney. 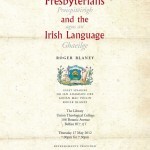 The Right Worshipful the Mayor Councillor Brian Heading requests the pleasure of your company at the launch of the reprint of Presbyterians & the Irish Language by Dr Roger Blaney / Dr RuairÃ­ Ã BlÃ©ine in the Cherry Room, Lagan Valley Island on Tuesday 15th May 2012 at 7.00 pm. 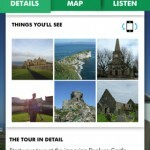 A new database containing over 30,000 entries has been added to the member’s only section of Ancestryireland.com. Alumni Dublinenses is a register of the students, graduates, professors and provosts of Trinity College, University of Dublin. This register contains 32,345 entries between 1593 and 1860 and is searchable by first name and surname. 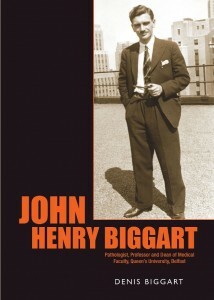 The trustees of the Ulster Historical Foundation cordially invite you to the launch of John Henry Biggart: Pathologist, Professor and Dean of Medical Faculty, Queen’s University, Belfast by Denis Biggart in the Christ Church Library. Light refreshments will be provided and there is parking available. Caught between Reformations is an upcoming lecture by Professor Colm Lennon (NUI Maynooth) organised by the Ulster Society for Irish Historical Studies. It will be taking place on the 19th of April 2012 at 8pm at Queen’s University Belfast’s School of History and Anthropology, G01, 16 University Square. The Community Relations Council and the Heritage Lottery Fund are holding a series of 10 weekly lectures covering this critical historical period. The format will be symposium style with one hour for speakers and one hour discussion based on questions from the audience. The principal speaker will provide the overview for about 30 minutes. This will be followed by two experts, giving different perspectives.